Have you ever thought to yourself, “I’d love to be able to pee like a guy?” If yes, then keep on reading for all the details about this popular brand of female urinal from Thee-Home. There are a ton of situations in which a woman might want to pee while standing up like in almost any outdoor situation. Camping, hiking, backpacking, boating, cycling, or rock climbing just to name a few. You might also love this for road trips. Your small bladder, combined with a Female Urination Device and a wide mouthed Nalgene Bottle might equal a lot more happiness! Finally, you could consider using this pee funnel for gross public bathrooms. For example, traveling in underdeveloped countries, or at a big festival with nasty porta-potties. Very reasonably priced (about half of the more expensive ones like the Freshette). Includes a nice carrying bag. Hydrophobic (repels water) so it’s very easy to clean. Just give it a shake and that’s about it! 100%, no questions asked, money-back guarantee. Most people find it easy to use after a few trial runs in the shower. Soft material that feels nice next to the skin. The best place to get a female urination device, including this one from Thee-Home is on Amazon. You can get all the styles, brands, and colours. Plus you can see user reviews and ratings. Some uncertainty as to what kind of material this product is made from. It only says this on the product description on Amazon, “Sensor urinal , high quality , rurable, portable.” This basically says nothing of substance. Poor quality of English on the product description on Amazon. Does not fold up like some of the other FUD’s. Some people find that it’s quite narrow, however, it does seem to work for most people. Be sure to have a few practice runs in the shower before using it for real. It looks quite narrow, but most people find that it works well enough. You might have better success using two hands to place it correctly. DO NOT pee into the wind with female pee funnel. Just trust us on that one. Although this female urination device repels water quite well, and it antibacterial, you’ll probably have to give it a wash with soap and water once in a while to keep it in tip-top shape. Who Should Use a Female Pee Cup? 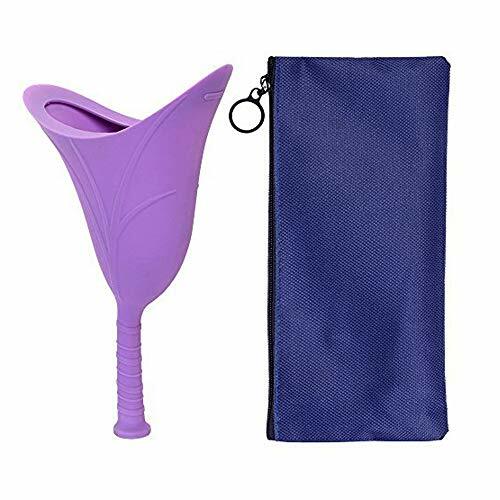 Use a female pee cup for after surgery. If you have foot, ankle, knee, or hip surgery, a female pee cup can be a lifesaver. When you’re in pain, bending your knees to sit down on the toilet can be pretty tough! That’s why it’s ideal to have a female pee cup like this one from Thee Home that allows you to pee while standing up. “I’m so, so thankful that thenurse in the hospital mentioned pee funnels to me after my knee surgery. I didn’t even know that these products existed, but it has really saved me a ton of pain.” Tonya M.
Some trans people may prefer to pee standing up, even if their anatomy doesn’t allow them to do this easily. Pee funnels make a great option. If you work in a very remote place, you may not have access to toilet facilities. If there are trees, it’s not a problem. But, if you’re in a very flat, exposed place it may be hard to pee with any privacy. A female pee cup can help you to pee discreetly, while standing up. And, you’ll only have to take off minimal amounts of clothing while doing it. Camping in the rain? Use a female urination device! Maybe you’ve had the experience of having to get up to pee when you’re camping in the rain or cold? It’s not pleasant to say the least. It is, however, usually all warm and cozy inside of your tent. What if you could pee inside the tent? Guys have been doing it for years by having an old water bottle reserved for this purpose. It’s now also possible for women by using a female pee cup, combined with a water bottle. This allows you to pee inside your tent. Avoid the cold and then, and then just empty the water bottle in the morning. It’s the ultimate camping solution. We’re a little bit conflicted about this female urinal from Thee Home. This female pee cup does have some excellent reviews on Amazon. Our own experience with the product has been positive and we found it extremely easy to use (as many of the Amazon reviews mention). We did a few test runs in the shower, and then took it on a big hiking trip. The result = no pee on shoes or pants. As far as pee funnels go, this is a serious win! You do have to use a bit of time and care to position the funnel properly, but once you do that, it’s almost fool-proof. The thing we’re conflicted about is that there isn’t much information on where and how this female pee cup is manufactured. We’d also love to know what the product is made from (our guess is silicone). Other than those unanswered questions, it’s a top-quality pee funnel that works well for most people who try it. It’s reasonably priced, at about half the cost of some of the other ones on the market. For the price, this female urination device from Thee-Home is certainly worth a try. We also love their 100% money-back guarantee, so you actually have nothing to lose if this thing doesn’t work well for you. Is this pee funnel the one for you? Or, are you considering a different female urination device? Any tips and tricks for making it work? Leave a comment below and let us know. Also be sure to give this article a share on Facebook, Twitter, or Pinterest.